Cheese, whether homemade or purchased, can be aged easily in your refrigerator. Controlling humidity levels and temperature are important for aging the cheese and preventing dryness. The amount of humidity and temperature needed will vary by the type of cheese you’re aging, so follow guidelines for the specific cheese you’re using. Choose plastic containers larger than the cheese. This is necessary so that there is enough room in the container for the cheese to breathe. You should consider a container sized appropriately to allow 40% cheese and 60% empty space. Wash the container and lid in bleach solution by mixing one-quarter cup bleach to one quart water, and dry thoroughly. Place cheese inside the container. Saturate a paper towel with the bleach solution and ring out until damp. Create a ball from the towel and place it inside the container with the cheese to provide humidity. Make sure the paper towel does not touch the cheese. Apply the container lid and snap into place. Make sure the lid is shut completely for an air-tight seal. Place a label on the container, if desired, to indicate the date and type of cheese. Place the container in the warmest part of your refrigerator, usually in the middle or in a bottom tray. Try to keep the temperature between 45 and 58 degrees F.
Check the humidity inside the container weekly to make sure it is adequate. Replace the damp paper towel as needed. Wipe away any condensation droplets or pools of water which may have accumulated inside the container. Turn the cheese each time you inspect the humidity level. Monitor the cheese until it has been aged for the desired length of time. Do not allow soft cheese to sit in whey drainage. Monitor soft cheese every few days to remove any whey drainage and to keep the aging environment as dry as possible. 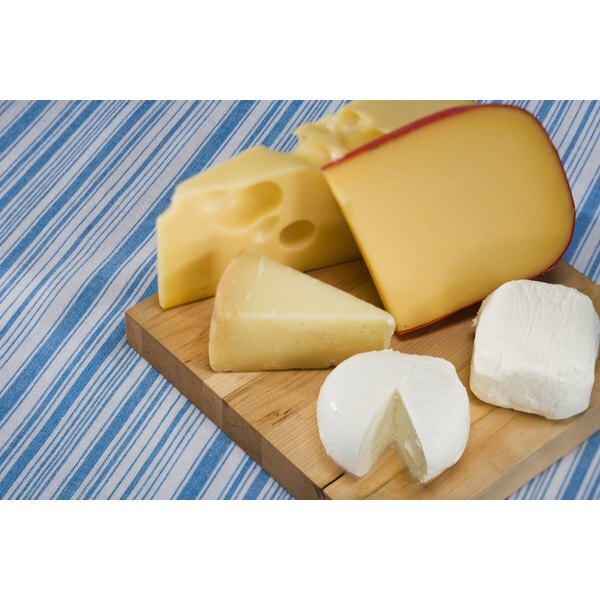 Do not allow cheese to sit in a wet container or mold may become a serious issue. Consider aging cheese in a cool place in your cellar or basement. Placing a paper towel rinsed with bleach solution helps prevent mold growth inside the container while aging cheese. Is Plain Yogurt or Cottage Cheese Better for You? Can I Have Cheese When Dieting?